A local electric scooter company is hoping to take the company national. Blue Duck, which was valued at $75 million last week, has collected a $15 million loan to expand and hire more employees, said company officials. Just a few months ago, Blue Duck struggled to roll out its local fleet of 500 e-scooters. Now, according to a spokesman, the company is up to 30 employees and are planning to purchase 30,000 scooters. “The hires and the funding round really create that velocity behind our growth,” said Farooq Malik, the company’s new director of finance and strategy. Malik, along with Chief Business Officer Michael Keane and Chief Technology Officer Drue Placette, was hired this month. Casey Whittington, who has been working for the company, was made the national director of government relations. Eric Bell, far left, is president of Blue Duck. For many scooters companies, one big problem has been getting their hands on the scooters, Malik said. Segway Ninebot, one of the biggest manufacturer, is currently dealing with the fallout from early models that had the potential for battery fires. Malik said with the cash infusion, Blue Duck can sign large volume orders that ensure a steady supply of the units. “We don’t want to put all our eggs in one basket,” he said of using multiple suppliers, including Segway. The company wants to be in “several hundred” markets in the next 12-24 months. Blue Duck is looking to launch in other cities and is also targeting large university campuses. Currently, it is competing with industry leaders Lime and Bird, which both have valuations more than 10 times Blue Duck, and large fleets of scooters. Blue Duck has for months played up the idea that they are the city-friendly company. 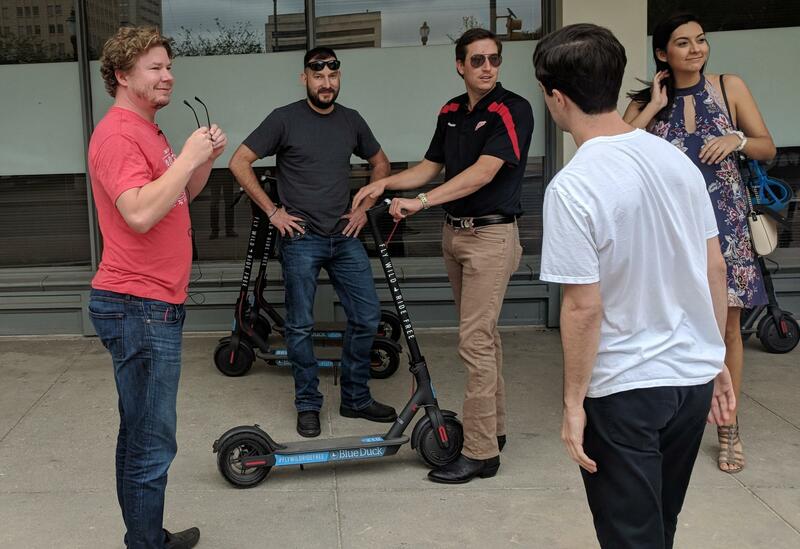 While the other scooter companies dropped off scooters without notice —as they did in San Antonio — Blue Duck worked early on with the city on regulations. “Boy, what a bad way to enter a market by just dropping big hunks of equipment on our sidewalks,” said Manny Pelaez, District 8 councilman, before praising Blue Duck at an Oct. 11 council meeting. The company’s other rollouts have not been as appreciated. Its scooters were removed by Texas State University in San Marcos and Southwestern University in Georgetown, Texas. Ford Motor Company just purchased scooter company Spin for estimates of between $40 and $100 million, but Malik said Blue Duck isn’t motivated by a future exit. “Honestly, I personally haven’t even thought about it,” he said. EDITOR'S NOTE: Two Blue Duck executives also work for Group 42, which is a contributor to TPRs Technology and Entrepreneurship desk. A man riding against traffic downtown was struck by a car Tuesday night is the latest in electronic scooter-related accidents since the San Antonio Fire Department started collecting data at the end of September. Rockdale, Texas, was chosen as the site for what some describe as the biggest bitcoin mine in the country. A Chinese company plans on bringing 400 jobs, while investing $500 million in the mine, which is where rows of computer processors solve complex computations and are awarded digital currency. This comes after a series of booms and busts for this town of 5,600 people.